Particularly for those who are approaching middle age, cataracts are a fact of life and a natural condition that has afflicted humans for hundreds, if not thousands of years. In simple terms, a cataract is a white, cloudy formation or opacity that develops in the lens of the eye—progressing slowly over time and with age—reducing the amount of light that passes through it and leading to blurred vision and, if left untreated, blindness. According to the World Health Organization (WHO), more than 90 percent of people over age 65 will develop cataracts, which annually causes total vision loss in approximately 20 million people, most of whom have little or no access to proper medical care. As life expectancy increases, the WHO anticipates those numbers will increase, particularly in developing countries. But despite the fact that cataracts remain the leading cause of blindness throughout the world, there is good news: Thanks to modern medicine and advances in technology, cataracts can be easily diagnosed and treated with relatively painless and brief procedures that not only restore sight but also dramatically improve quality of life. Myths, Facts and Risk Factors Myths and misinformation abound regarding the causes, symptoms and cures for cataracts, which is neither a disease that spreads from one eye to the other nor one that results from eye strain or overuse. Cataracts do, however, increase exponentially with age. Here’s why: The lens, which lies behind the iris and the pupil, functions similar to the lens of a camera by focusing light onto the retina at the back of the eye where an image is recorded. Consisting primarily of water and protein, the lens also adjusts the eye’s focus in order to see objects both near and far away. As a person ages, the protein—arranged with precision to keep the lens clear and allow light to pass through—clumps together and clouds a small area of the lens. Over time, the cataract may grow larger and cloud more of the lens, significantly impacting vision clarity. 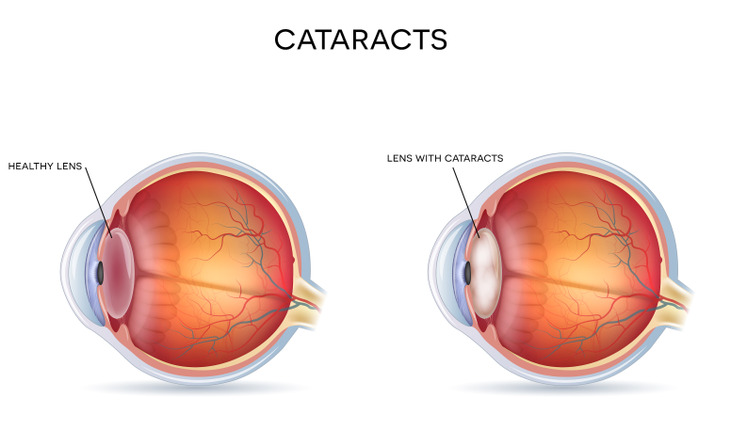 During the early stages, cataracts have little effect on vision and, as a result, the condition often goes undetected until more pronounced symptoms are present. As the cataract progresses, symptoms may include double vision or clouded vision, which is often described as looking through a dirty window. In addition, images may appear with a yellow tint as the vibrancy of colors diminishes. Reading, too, becomes challenging as the contrast between letters and their backgrounds decreases. Some experience an increased sensitivity to bright lights, which makes driving at night difficult or impossible due to scattered glare from the headlights of oncoming cars. In advanced cases, the pupil—normally black—looks milky and eventually vision is reduced to the ability to only distinguish light from dark. Although some cataracts may stop progressing after a certain point, the condition is never reversible and surgery is the only option to restore eyesight to clarity. Since cataracts is not a life-threatening condition nor cause for emergency, many people manage early stages of cataracts by wearing stronger eyeglasses or contact lenses, or taking medication that dilates the pupil. When vision loss impedes or interferes with everyday activities, surgery is recommended. Phacoemulsification (phaco) is the most common type of cataract surgery, normally completed within 15 minutes and with little discomfort to the patient. Through a small incision made on the side of the cornea, an ophthalmologist inserts a tiny probe, which emits ultrasound waves that soften and break up the lens. The affected lens is removed by suction and replaced by an intraocular lens (IOL), a clear, plastic lens that requires no care and becomes a permanent part of the eye. Today, new lifestyle (or lifetime) lenses offer all ranges of vision from near to far away, with astigmatism correction if needed. Patients will most often not require assistance after cataract surgery, but vision acclimation may take several days. Complete vision restoration, which results in almost 95 percent of all patients, can be expected within one to four weeks. If eyes are the windows to the soul, they most certainly provide deep insight into a person’s state of health. So, above all, visit an eye doctor for a dilated eye exam once every two years and yearly after age 60. Not only can a comprehensive eye exam diagnose cataracts, dry eye, and other vision-related issues but also a broad array of health conditions, from hypertension to diabetes. Prevention has long been recommended as the best medicine and safeguarding vision during the aging process can have a tremendous impact on every aspect of life. Cataracts are often a fearful proposition when poorly understood. Knowing the facts and making educated decisions will go a long way in ensuring the precious gift of sight will last a lifetime. Dr. Sheri Rowen founded Mercy Medical Center Department of Ophthalmology in Baltimore in 1996 and served as the medical director of this full service ophthalmology and aesthetics practice until 2015. Dr. Rowen is a board-certified physician who pioneered new treatments and techniques for cataract surgery, being one of only a handful of eye surgeons to introduce topical clear cornea cataract surgery with foldable lenses. She demonstrated these techniques in live surgery in France, Italy, Sweden, and Australia and was one of the first surgeons to pioneer CO2 laser eyelid surgery. A Phi Beta Kappa graduate of the University of Maryland College Park, Dr. Rowen received her medical degree from the University of Maryland in Baltimore. She completed her surgical internship and fellowship at the prestigious Johns Hopkins Hospital and a two-year vitreoretinal research fellowship at the renowned Wilmer Eye Institute. She is considered a key opinion leader in ophthalmology and enjoys teaching residents and her peers by sharing new concepts about surgical innovations and related pharmaceutical treatments. Her scientific articles, papers and interviews continue to populate the field. Dr. Rowen resides in Newport Beach, California where she moved to be close to her two grown daughters. NVISION Eye Centers is one of the leading providers of LASIK and cataract surgery in the U.S., with 22 centers in California, Nevada and Oregon. An innovative leader in ophthalmology, NVISION is dedicated to providing the best patient experience through the use of the latest technology and treatment by the most talented and experienced surgeons in the industry. NVISION was founded by Tom Tooma, M.D., one of the earliest pioneers of LASIK who has performed more than 100,000 procedures throughout his esteemed career. With more than 1,900 eye doctors referring their patients and trusting their own eyes to NVISION surgeons, NVISION Eye Centers is the Eye Doctors’ #1 Choice®. For more information, visit www.NVISIONCenters.comor call (877)455-9942.